The Smallholders kit is the perfect ensemble for those looking for a full power rifle to control pests and vermin on their land. This kit is based around a full power, break barrel spring air rifle in .22 calibre which makes it effective to ranges up to 40 meters. Examples of pests it is effective against are rabbits, pigeons, rats and squirrels. The rifle has a rifled steel barrel which ensures great accuracy and the spring and piston power system is reliable and easy to use. The two stage trigger has a clean and crisp break on each pull which prevents the chance of you pulling the shot off course. 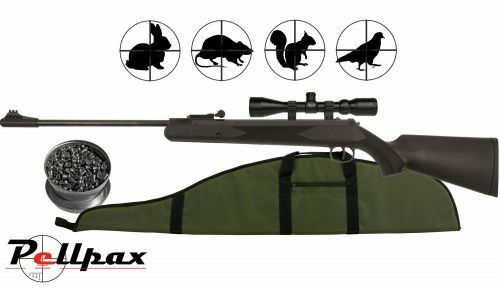 Along with this rifle, the kit includes a 3-9x40 scope with mounts, a tin of .22 pellets and a gun bag to keep everything safe during storage and transportation. This is the perfect kit to start controlling those pests today. Add this item to your basket & spend an extra £310.01 to apply for finance.